France's most violent urban riot in a decade engulfed central Paris on Saturday as "yellow vest" activists torched cars, smashed windows, looted stores and tagged the Arc de Triomphe with multi-colored graffiti. 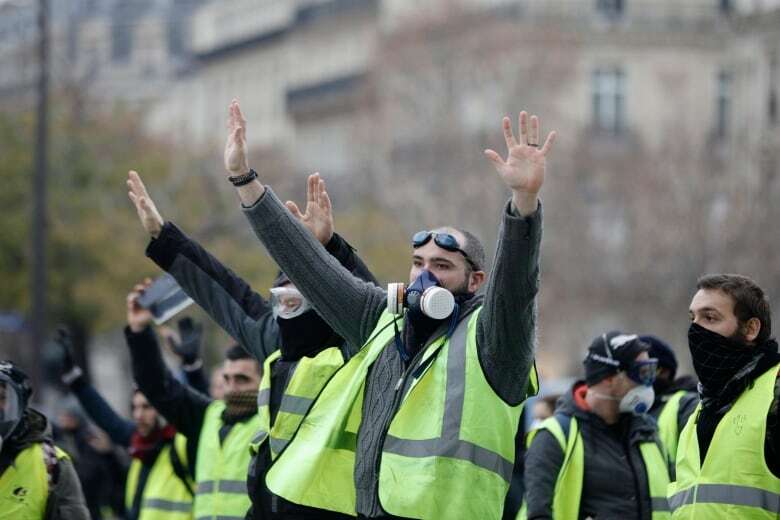 Protesters angry about rising taxes and the high cost of living clashed with French riot police, who closed off some of the city's most popular tourist areas and fired tear gas and water cannons as they tried to quell the mayhem in the streets. French President Emmanuel Macron denounced the violence from the G20 summit in Argentina, saying those who attacked police and vandalized the Arc de Triomphe will be "held responsible for their acts." He said he will hold an emergency government meeting Sunday on the protests. "[Violence] has nothing to do with the peaceful expression of a legitimate anger" and "no cause justifies" attacks on police or pillaging stores and burning buildings, Macron said in Buenos Aires. He refused to answer any questions from journalists about the situation in Paris. It was the third straight weekend of clashes with activists dressed in yellow roadside safety vests and the worst urban violence since at least 2005. The scene contrasted sharply with other protests in France, where demonstrations and road blockades elsewhere on Saturday were largely peaceful. 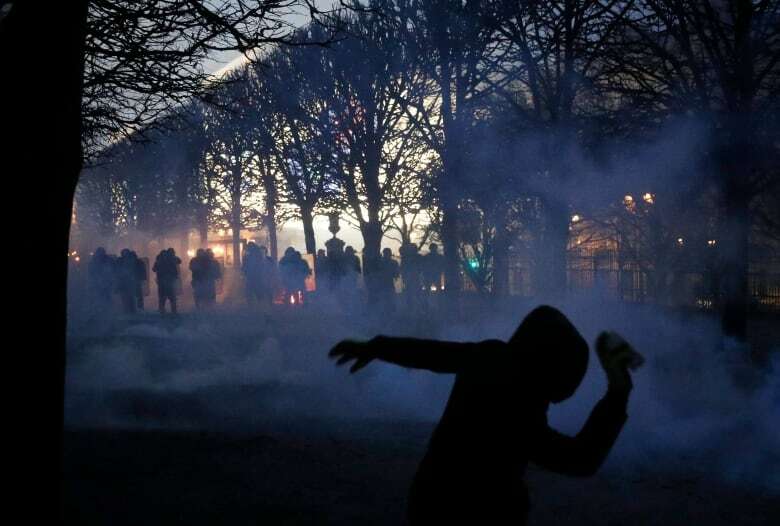 Interior Minister Christophe Castaner, speaking on French television channel TF1, said one protester was in a life-threatening condition after being part of a group pulling down a metal fence at the Tuileries gardens. A video on social media shows the heavy fence falling on some protesters. By the afternoon, clashes continued down several streets popular with tourists. 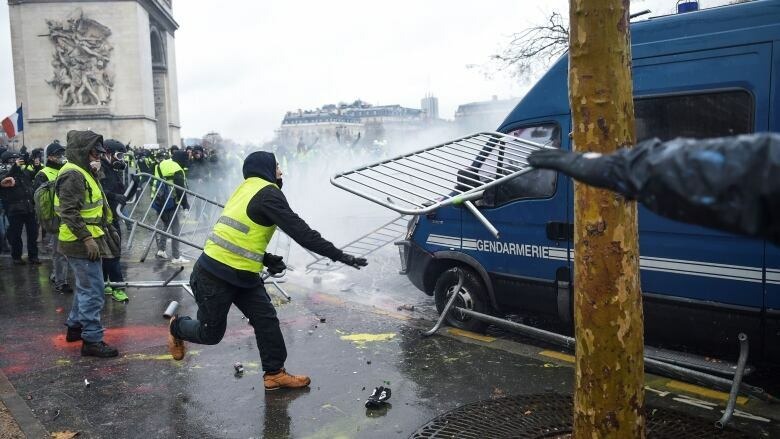 Pockets of demonstrators built makeshift barricades in the middle of Paris streets, lit fires, torched cars and trash cans, threw rocks at police and smashed and looted stores. Some demonstrators removed the barriers protecting the Tomb of the Unknown Soldier from the First World War under the Arc de Triomphe monument to pose near its eternal flame and sing the national anthem. They were dispersed by police. 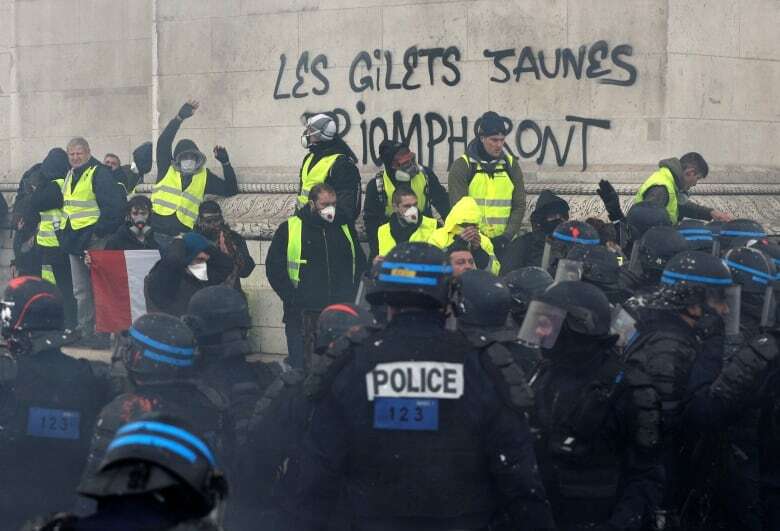 Graffiti sprayed onto the Arc de Triomphe wrote: "yellow vests will triumph." By Saturday afternoon, central Paris was locked down by police, with all roads leading away from the Arc closed off as more police moved in. Over 20 downtown Paris metro stations were closed for security reasons and police ordered stores in nearby neighborhoods to close early Saturday evening. French television showed police leading a shaken woman away from the protesters, and loud bangs rang out near the famed Champs E​lysées Avenue where the violence was centred. In addition to the tax burden, the demonstrators are furious about Macron's leadership, saying that his government does not care about the problems of ordinary people. The grassroots protests began with motorists upset over a fuel tax hike, but now involve a broad range of demands related to France's high cost of living. Earlier Saturday, several hundreds of peaceful protesters in Paris passed through police checkpoints to reach the Champs-Élysées. They marched on the famed avenue behind a big banner writing "Macron, stop taking us for stupid people."